More than a hundred Heads of State and Government will gather in New York this week to adopt the 2030 Agenda for Sustainable Development. This agenda is intended to make the UN ‘fit for purpose’, but it is important to ask, ‘whose purpose will it be fit for’? A new study from Global Policy Forum warns that the United Nations is embarking on a new era of selective multilateralism, shaped by intergovernmental policy impasses and a growing reliance on corporate-led solutions to global problems. The changing funding patterns of the UN and its funds, programmes and specialized agencies reflect these alarming trends. Key features are the growing gap between the scale of global problems and the (financial) capacity of the UN to solve them; the growing share of non-core contributions and earmarked trust funds in UN finance; increased reliance on the corporate sector; and the outsourcing of funding and decision-making to exclusive global partnerships. Download full report here (PDF, 2,5 MB). For single chapters, please see here. New York City, 22 September 2015. More than a hundred Heads of State and Government will gather in New York this week to adopt the 2030 Agenda for Sustainable Development. 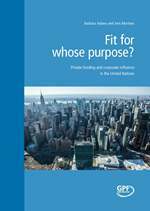 This agenda is intended to make the UN ‘fit for purpose’, but it is important to ask, ‘whose purpose will it be fit for’? A new study from Global Policy Forum warns that the United Nations is embarking on a new era of selective multilateralism, shaped by intergovernmental policy impasses and a growing reliance on corporate-led solutions to global problems. The changing funding patterns of the UN and its funds, programmes and specialized agencies reflect these alarming trends. Key features are the growing gap between the scale of global problems and the (financial) capacity of the UN to solve them; the growing share of non-core contributions and earmarked trust funds in UN finance; increased reliance on the corporate sector; and the outsourcing of funding and decision-making to exclusive global partnerships. Fit for Whose Purpose? Private Funding and Corporate Influence in the United Nations, released today, gives a comprehensive overview of current UN funding trends and ends with a summary of findings and policy recommendations to counter the new ‘business model’ of global governance and to make the United Nations really ‘fit for purpose’, fit for the purpose of a democratic and inclusive global governance. Detailed and specific, the demands range from adopting measures to limit earmarked funding as a percentage of total funding, to strengthening the rules and tools governing engagement with the business sector, and to establishing an intergovernmental framework for partnership accountability. Source: Global Policy Forum (GPF).